5 March 1907: Entered the Army as a Fahnenjunker in the Fußartillerie-Regiment von Dieskau (Niederschlesisches) Nr.6. 1 August 1914: Adjutant of the II. Battalion of Foot Artillery Regiment 6. 24 December 1914: Battery Leader in Foot Artillery Regiment 6. 1917: Commander of Foot Artillery Battalion 136. 23 September 1919: Transferred to the Heavy Reichswehr Artillery Battalion 6 of Reichswehr-Brigade 6. 15 March 1920: On the staff of the II. Battalion of Reichswehr Artillery Regiment 8 of Reichswehr-Brigade 8. 28 March 1920: Battery Leader in Reichswehr Artillery Regiment 8 of Reichswehr-Brigade 8. 18 September 1920: Battery Chief in Reichswehr Artillery Regiment 6 of Reichswehr-Brigade 6. 1 January 1921: On the staff of the II. Battalion of the 3rd (Prussian) Artillery Regiment upon the formation of the new Reichsheer from the Übergangsheer or Transitional Army. 1 April 1925: Battery Chief in the 3rd (Prussian) Artillery Regiment. 1 February 1928: Adjutant of Artillery Leader I, Königsberg. 1 April 1932: Commander of the I. Battalion of the 1st (Prussian) Artillery Regiment. 1 April 1934: Commander of the Army Gas Defense School in Berlin, from January 1939 in Celle. 1 August 1944: Army High Command Leader Reserve. 30 September 1944: Retired from the Army. 14 April 1945-15 October 1947: Prisoner of war in British captivity. Bradley, Dermot. Die Generale des Heeres, 1921-1945, Band 7 (Knabe-Luz). Biblio Verlag, Bissendorf, Germany, 2004. While chemical weapons were fortunately not employed in battle during World War II, the German Army, like most major armies of the day, devoted much effort to training its troops in gas protection measures. The German Army fielded a wide array of decontamination vehicles as well as personnel, animal and equipment decontaminates and protective agents (liquids, creams, tablets, swabs, inhalants, etc. ), gas detection alarm systems and defense shelters. Additionally, the German Army issued each soldier a gas mask and an anti-gas cape as part of his standard equipment kit. The gas mask was carried in the highly distinctive fluted metal M1930/38 canister frequently seen in photographs of German troops in World War II. 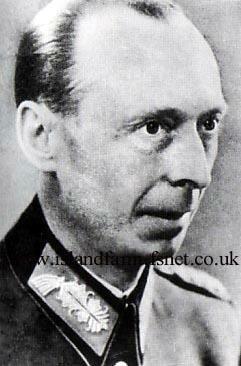 On 1 August 1944, Generalmajor Johann Albrecht von Blücher (23 November 1892-14 May 1972) succeeded Generalleutnant Leister as Inspector of the Smoke Troops and Gas Defense. He served in this capacity for the remainder of the war.